Korean decorative art, which includes lacquerware, pottery, sculpture, calligraphy and painting evolved through several centuries. While sharing some motifs, techniques and aesthetic concepts with its closest neighbors, China and Japan, Korean art developed its own characteristically and unmistakably Korean style. Artists in Korea approach their art with a sense of harmony with nature, spontaneity and simplicity. For centuries it did not change, it was naturalistic since the time of the Three Kingdoms, circa 57 BCE to 668 CE. Most of the art forms in Korea were unadorned, appreciating more the natural grains of a piece of wood or the inherent characteristics of the materials being used, such as the clay that potters used. This approach allowed them to work unrestricted by conventions, producing works that were distinctive in its creative simplicity. This was evident in the simple shapes and in the use of devices and motifs. A white porcelain vase may only have a stem of flower in a single color, meant more to enlarge the background than to fill a space that seemed empty. Korean art traditionally avoided extremes. Extreme curvilinearism as well as extreme straight lines were simply not part of their style. Garish colors, steep planes, strong lines and sharp angles were avoided, not only in art but also in architecture. That is why traditional Korean roofs have gentle slopes compared to the more sharply curved roofs of traditional Chinese buildings. Koreans simply prefer their art to be mellow and gentle, fluid and rhythmic. The Chinese were the first to have its influence in Korean culture, which stated in the latter part of the Neolithic Period. Stronger Chinese influence was felt during the Han Dynasty, particularly in Nangnang, which is close to Pyongyang. Korean craftsmen learned advance techniques in making pottery, including the use of closed kiln and a potter’s wheel as well as iron smelting. From this period, the flat-bottomed vessels were decorated with either lines, fingernail marks or dots that later developed into the comb-pattern pottery, which was also evident in prehistoric art in Siberia. Goguryeo was introduced to Buddhism by China, which started a heightened blossoming of the arts, with the building of numerous pagodas and temples. Sculpture were mostly concentrated in the creation of Buddha images. Buddhism and its related art spread into the two other kingdoms eventually and until the 15th century, was part of the art forms of Korea. It was the Korean immigrants that introduced Chinese writing and Buddhism to Japan, which also had a great impact on Japanese art. There were several Korean artists that made a distinct name for themselves in Japan. Early paintings in Korea featured shamanistic deities. Later the paintings had Taoist and Buddhist themes, constellations and heavenly bodies as well as the daily lives of aristocrats. Most of the early paintings were seen in decorated tombs of royalty. During the last dynasty in Korea, the Joseon era, court painters were employed by the office of painting, following the system of the professional court painters of China. Peach blossoms, springs and mountains began to make an appearance in most paintings. Animals, insects, birds, orchids, plum trees, bamboo and pine trees were also some of the favorite subjects. One of the great painters in Joseon was Cheong Seon, who specialized in depicting the real landscape in Korea, particularly the rugged peaks of Mount Geumgang (Diamond Mountain), which is now a part of North Korea. He was the first to use wrinkles of vertical lines to show the soaring forests and rocky cliffs of the mountain. It became such a popular genre with many followers. One that stood out was the scholar-painter Kim Hong Do, which started the trend of painting the daily lives of the common folks (minhwa). 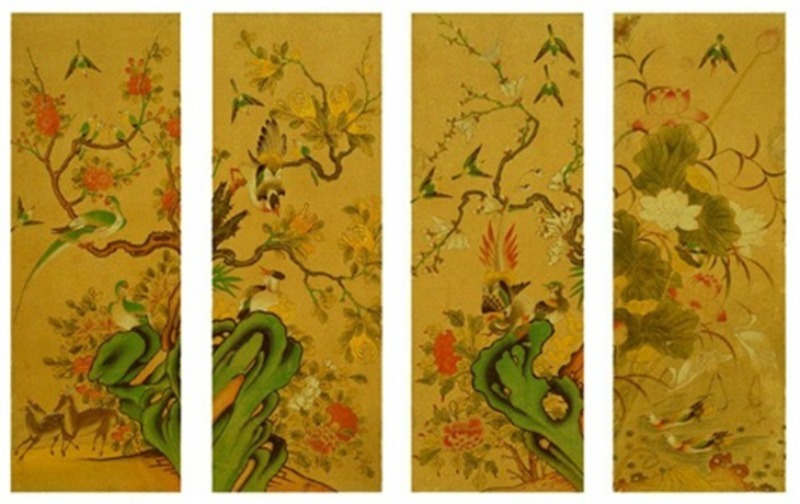 Western art influences crept in during the 18th century, adding perspective and shading techniques to the traditional art style of Korea. Koreans started their distinct porcelain with celadon glaze around the 11th century (Goryeo Era). Their special greenish blue color was highly regarded as one of the best in the world by the Song Chinese. During this early period the potters specialized in incense burners and fruit- and animal-shaped pitchers. Inlaid celadon wares became the craze in the years 1150 up to 1250. 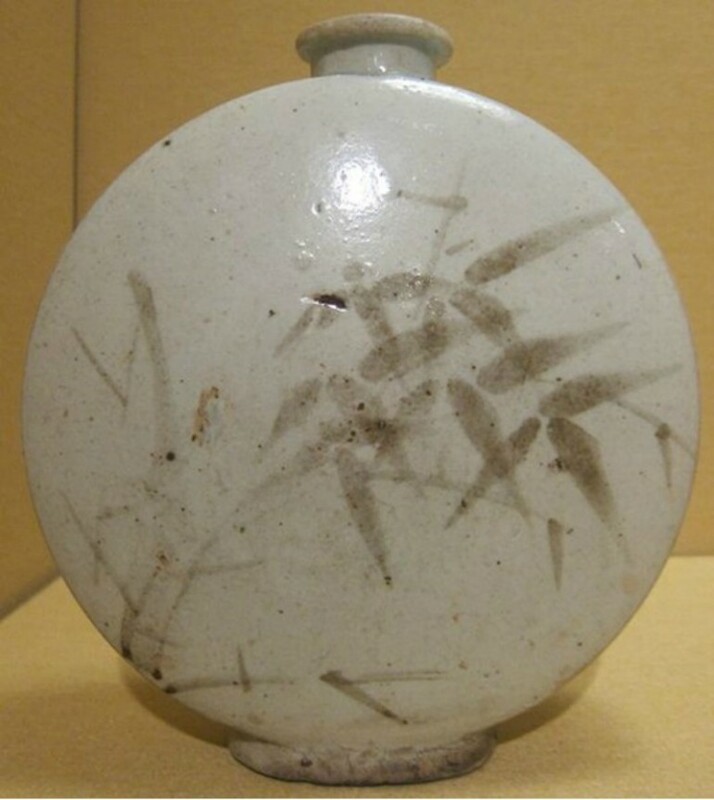 This was a Korean invention and unique to their pottery art from the 12th to the 15th centuries. Koreans also developed another specialty, inlaid lacquer, where cut pieces of tortoise or abalone shells together with bronze or silver wire were pasted on hemp-coated pinewood base then sealed with a thick coat of lacquer before being polished with charcoal and whetstone until the design is revealed on the surface. While more modern influences changed the forms and styles of Korean art through the years, the basic core is still anchored on simplicity and harmony.